Craniosynostosis, or premature closure of one or more of the cranial sutures, is far less common for both preterm and term infants but can look similar to some types of deformational abnormalities. Deformational plagiocephaly is the flattening of one side of the posterior skull, creating an oblique or slanted head when viewed from the top. Ipsilateral (along the same side) frontal bossing and asymmetric facial features result, however, the degree of flattening of the occipital skull is more pronounced and results in a parallelogram shape when viewed from above the infant’s head. 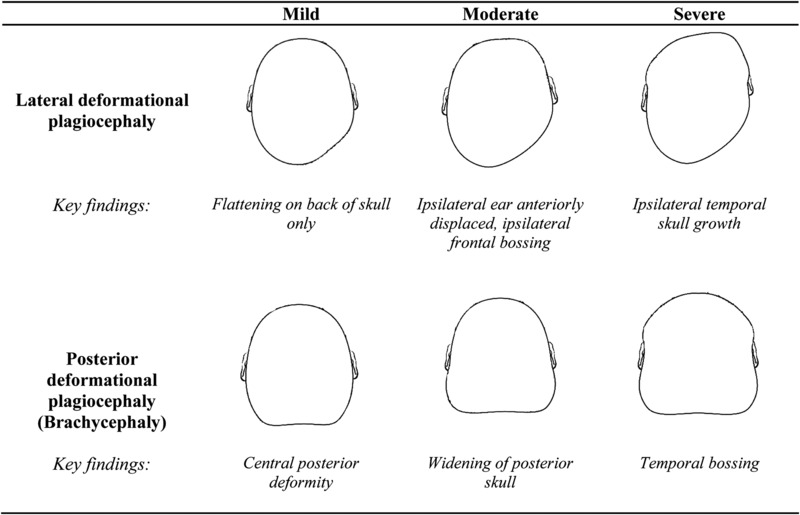 See Vertex views of lateral and posterior deformational plagiocephaly (Journal of Pediatric Health Care), Table 1 in [Looman: 2012]. Deformational brachycephaly is the symmetric flattening of the occipital skull with compensatory bi-parietal widening, giving the appearance of a large head when viewed from the front. Some degree of asymmetry is commonly seen. See photo. These infants may also have a posterior protrusion at the top of the head. When looking at the infant skull from the side, the skull appears to slope downward towards the anterior portion of the head. This is called a “turricephaly” or “tall head.” Images of brachycephaly (Acta Paediatrica), Figure 3 (page 4) in [Ursitti: 2011]. Deformational scaphocephaly (also known as dolichocephaly) is an uncommon variant seen in preterm infants who have been positioned on their sides, resulting in flattening of the sides of the head and compensatory increase in the anterior posterior dimension of the cranium. See photo. Preventive measures instituted in NICUs have decreased the incidence of this. Images of scaphocephaly (Acta Paediatrica), Figure 1 (page 3) in [Ursitti: 2011]. Differentiating deformational problems from craniosynostosis may require imaging. Since many infants will have deformational cranial abnormalities, the decision to image the infant using head computerized tomography (CT) may be best left to the specialist, perhaps reducing needless radiation exposure. Flattening occurs when cranial expansion and growth are consistently resisted in one area of the skull by an external force. [Rogers: 2011] [Rogers: 2011] Limited independent head mobility in very young infants or those with congenital muscular torticollis contribute to the flattening. Growth of the cranium is most rapid in the first few months of life and treatment is most effective in that time frame. Premature infants have more limited head mobility for a longer period of time than full term infants, which may explain their higher frequency of deformational cranial abnormalities. Sleep orthotic or cradle: these devices position the infant’s occiput on a concave rather than a flat surface. This redistributes the surface pressure on the occiput but maintains the infant in the supine position. This approach only works prior to 3-4 months of age corrected, when infants develop sufficient head control to defeat its purpose. Helmets do not apply pressure to the cranium but rather have foam selectively cut away from the area in which growth is desired thereby guiding growth in the path of least resistence. They do not mold or squeeze the cranium. A skilled orthotist is needed to monitor the growth of the infant’s head and the fit of the helmet. Plastic Surgery: Provides expertise in evaluation of head shape deformations and management of injuries sustained during the NICU hospitalization. Such injuries can be a result of intravenous infusions, CPAP, other medical equipment, and medical procedures that were necessary during the NICU hospitalization (see all Pediatric Plastic Surgery services providers (1) in our database). Orthotist: A person skilled in providing supportive equipment for a desired functional outcome. In the case of cranial deformation abnormalities, this individual makes the helmet and monitors its function closely throughout its use on the infant’s head to ensure the best growth and prevent skin sores and discomfort for the infant. Pediatric Neurosurgery: Provide evaluations, recommendations, and management for severe or persistent cranial deformations see all Pediatric Neurosurgery services providers (1) in our database. We currently have no nationwide Physical Therapy service providers listed; search our Services database for related services or, if relevant for you, a state link above. Laughlin J, Luerssen TG, Dias MS.
Prevention and management of positional skull deformities in infants. Evidence-based care of the child with deformational plagiocephaly, Part I: assessment and diagnosis. Nield LS, Brunner MD, Kamat D.
The infant with a misshapen head. Deformational plagiocephaly, brachycephaly, and scaphocephaly. Part I: terminology, diagnosis, and etiopathogenesis. Deformational plagiocephaly, brachycephaly, and scaphocephaly. Part II: prevention and treatment. Task Force on Infant Sleep Position and Sudden Infant Death Syndrome. Changing concepts of sudden infant death syndrome: implications for infant sleeping environment and sleep position. American Academy of Pediatrics. Task Force on Infant Sleep Position and Sudden Infant Death Syndrome.